This is yet another HUGE new release from IBWT music! 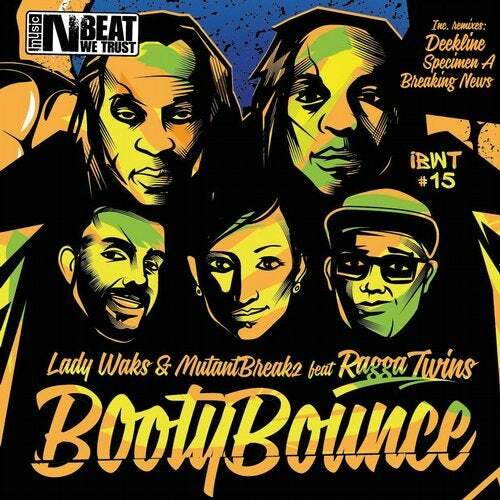 Label boss Lady Waks has again collaborated with the Spanish breakbeat dons Mutantbreakz. This time around they bring the legendary Ragga Twins along for the ride. 100%% dancefloor KILLER!. With mesmerising grooves and on-point production, this one will be playing all summer. - Deekline comes with the first remix on the package. This one is a perfect dancefloor roller and brings out a whole new side to the original. Magical melodies and deep bass! What else can you ask for?- The Specimen A remix is a tougher sound but is aimed squarely at the dancefloor and your speakers!- The remix from Breaking News is a classic booty breaks banger with hip-hop melodies and bouncing groove, fat bass and excellent rhythmSupported: The Crystal Method, Plump DJ, Far Too Loud, Keith Mackenzie, Slyde, Jay Cunning, Alaska MC, Billy Daniel Bunter, Detach, Kickflip, B-Phreak, Basement Freaks, KL2, Rob Ferri, Audio Dropout, Pale Penguin (VIM), Rasco, DJ HOOK, Ben & Lex, Kid Panel, Dave Remix, Lexani, Isaias Gil Marin, Dead Easy (NSB Radio) and many more!